It feels like a distant memory now, but Standard was actually pretty bad for the last few years. Now Guilds of Ravnica has revitalized it and Ravnica Allegiance looks like it’s going to continue the trend. I mean, seriously, have you seen this set? The number of cards that both look fun to play with as well as have a high power level is awesome. Here, sitting on the eve of the new Standard format about to be on display at SCG Indianapolis, first impressions are everything. As has come tradition each set, here are my loves and hates from Ravnica Allegiance. Make no mistake - level one for SCG Indianapolis is Hydroid Krasis. If you aren’t either playing Hydroid Krasis or have a good plan to beat Hydroid Krasis, you’re not going to have a good time. The comparisons to Sphinx's Revelation are perfectly apt, as both cards are very easy to underestimate if you are only thinking about them at one spot on your curve. Four mana for a 2/2 that draws a card and gains a life is underwhelming; Six mana for a 4/4 that draws two cards and gains two life is merely okay; Eight mana for a 6/6 that draws three cards and gains three life is not the best deal for eight mana. Compare this to Sphinx's Revelation - five mana to draw two and gain two, six mana to draw three and gain three, seven mana to draw four and gain four... it all looks pretty mediocre. However, you’re not locked into any of those particular permutations. That’s why Sphinx's Revelation was so good and that is why Hydroid Krasis is so good. Just get mana, play it for as much as you can, and it not only finds you another copy but also buys you the time to use it. 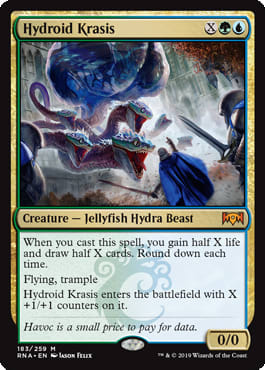 Hydroid Krasis is one of the best cards in the set. It’s okay. I was fooled, you shouldn’t feel foolish about being fooled too - Rhythm of the Wild is basically unplayable. Fires of Yavimaya was a long time ago, back in a time where creatures sucked. It also had Saproling Burst as its tag team partner, which was quite the duo. The problem is that it’s not 2001. The power level of early game threats is astoundingly higher now than it was then and taking a turn off to play a three mana enchantment that has no immediate impact on the board is not worth the tempo black hole it creates. Rhythm of the Wild is only good if you play it perfectly on curve, preferably turn two off a Llanowar Elves, and your entire hand lines up perfectly around it. Otherwise, it’s just a huge hassle that slows you down more than it speeds you up. It can still work as a sideboard card, or if someone were to use it as a more combo-based card to give mana creatures haste while drawing a lot of cards. I could buy that too, but Rhythm of the Wild is nothing more than a fringe card at best. Okay, it’s a reprint. Mortify isn’t a flashy new planeswalker or mythic rare. It is however one of the most important removal spells in both the set and the format. There are two major reasons for this. First, enchantments are everywhere. Wilderness Reclamation, Search for Azcanta, History of Benalia, Conclave Tribunal, Experimental Frenzy, Theater of Horrors... the list goes on and on. The strength of enchantments typically is that they are the hardest card type to interact with; if you play an enchantment, usually it’s going to sit there for the rest of the game. As such, being able to actually remove them effectively is huge. 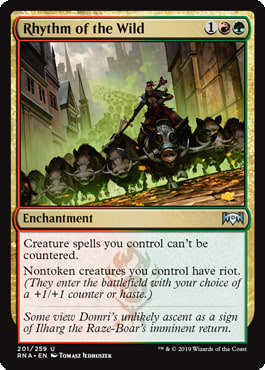 Secondly, it’s hard to understate how important having a removal spell that can kill any creature while also not being dead in your control and combo matchups is. The various Wilderness Reclamation decks are going to often be difficult Game 1s because what they are doing is so different than the rest of the format, but having maindeck enchantment destruction will go a long way toward being able to beat them. If you can play Mortify, you should be. From awesome flexible answer to super fragile and weak answer; Deputy of Detention is not a good Standard card. Standard is a format dominated by threats and removal. Fiend Hunter has never been good in these scenarios, nor will it ever be. Deputy of Detention is neither a good creature nor a good removal spell. The body is almost irrelevant, which means it sits in play waiting for your opponent to kill it and blow you out in combat or at the end of a critical turn. If you want a removal spell, play an actual removal spell. 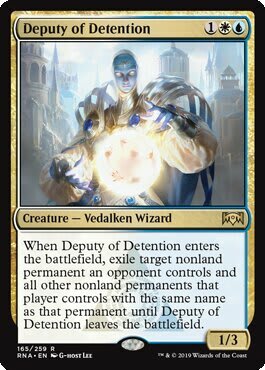 There’s no Collected Company or Aether Vial in Standard to make you want this effect on a creature, and unless the format somehow shifts away from every deck having multiple removal spells Deputy of Detention is just asking for trouble. Hero of Precinct One looks very unassuming. No first strike, no vigilance, no flying... just a basic ole Grizzly Bears. However, given the huge density of cheap multicolored and hybrid cards in Standard, Hero of Precinct One is much more than meets the eye. “Army in a can” cards like Young Pyromancer, Goblin Rabblemaster, and Monastary Mentor have always been staples in Standard; if you put a cheap and decent sized body in play that can make an army all by itself, that opens to the door to both card advantage and synergy. Maybe you’re sacrificing the creatures to Priest of Forgotten Gods, or pumping them with Judith, Scourge Diva, Heroic Reinforcements, or Flower // Flourish. Maybe you’re just blocking and buying time while playing a solid value game. 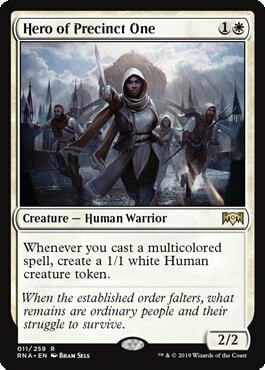 The end point is that Hero of Precinct One does all of that and more at a low cost and a low deck-building requirement of just playing good multicolored cards. Hero of Precinct One is great! Much of what was said about Rhythm of the Wild can be said about Domri, Chaos Bringer, but he adds an additional mana on top as well as being extremely fragile. Domri is a bad Fires of Yavimaya and a bad card draw engine. Domri does nothing to effect the board the turn it comes into play, which is a death sentence on turn four. If you thought wasting turn three was bad, just wait until you try wasting turn four! Domri may see some sideboard play against decks that don’t attack or pressure you, as he is a passable card draw engine for a creature heavy deck, but he is nothing more than fringe sideboard card. 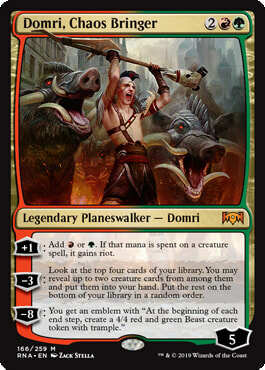 Don’t let his mythic rare status or past incarnations fool you, this Domri is a complete miss. Have you ever activated a Priest of Forgotten Gods? Boy does it feel good! Priest of Forgotten Gods is an awesome and cheap engine for creature decks. It’s easy to deploy early, demands an answer, and has the potential to take over the game with repeated activations. It plays awesome with token makers, death triggers, as well as the new Gutterbones. Whether you’re drawing cards off Midnight Reaper or dealing damage to things with Judith, the Scourge Devil, there’s always value to be had in creatures dying. Furthermore, with a constant flow of cards and mana it’s easy to keep the ball rolling. Priest of Forgotten Gods doesn’t immediately slot into any current deck, but has the potential to spawn multiple new archetypes with all of the tools available to it in Standard. This is not Mana Leak. At least Rune Snag would get better as the game went on and Miscalculation could cycle. Quench suffers from the same problems that plague Spell Pierce in Standard - games tend to go on for a while, meaning the extra two mana starts to float around pretty quickly. Spell Pierce has seen a little play in Standard, but usually only in very tempo-oriented, proactive decks. It is possible for Quench to find a home in those decks perhaps, but they are few and far between and often have better options. Quench is not really a card you want to have in your control deck. It goes dead far too quickly, whereas at least a card like Syncopate has some utility later in the game. Quench is better than Syncopate on turns two through five, so if that’s where your deck wants to play it’s okay, but most of the time it’s better left on the bench. Attention Magic players! 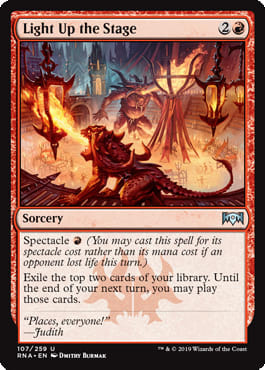 Light Up The Stage is here, and just because you thought it was like all other “exile and play this turn” cards doesn’t mean it actually is. It actually reads “until the end of your next turn” which is exceedingly better. Get your copies now! I’m happy that I wasn’t the only one to misread Light Up The Stage. This is essentially a Thoughtcast for Red decks, with the low low requirement of having to deal your opponent damage. It’s not a huge secret at this point, but giving aggressive Red decks and burn decks access to a one mana draw two is phenomenal; this a card that is poised to see play across all formats. 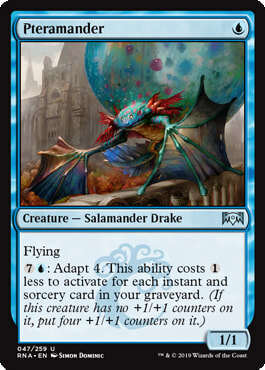 Speaking of all formats, people are looking at Pteramander like it’s the second coming of Delver of Secrets. Here’s a hint: it’s not. Pteramander isn’t a “bad card” per say, especially if you’re already in the market for a Flying Men. The issue is that it’s adapt ability is much more expensive than you think it’s going to be, making it a fairly unreliable mid to late game threat that is vulnerable to every manner of early game removal. 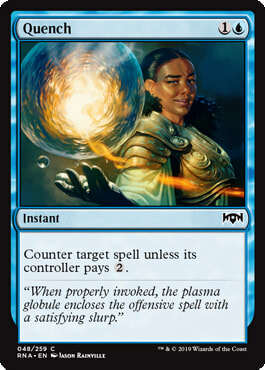 If you’re playing it in your Izzet Drakes deck, now you’re giving your opponent a target for those potentially dead copies of Shock, Lightning Strike, Moment's Craving, etc. It gets a bit more exciting in older formats when you can play cards like Thought Scour and actual cantrips, but again you’ve got your flying Gurmag Angler that’s going to be vulnerable to Gutshots and Lightning Bolts for a window unless you have the full seven instants and sorceries in your graveyard and a few extra mana to spare. Pteramander isn’t bad, but it isn’t nearly as good as you think it is. I’ve been working all week with Team BCW on trying to break this new Standard format and it feels like we’ve hardly scratched the surface. Honestly if we had a month I don’t even think I would feel fully ready. SCG Indianapolis this weekend is going to be one of the most exciting events in a long time. Am I right? Am I wrong? We shall see! What cards are you most excited about?